“Over easy” refers to preparing eggs such that the white is cooked while the yolk is just barely set to provide the perfect combination of textures. This column, much like its namesake, strives to provide the perfect balance of early morning sustenance and Atlanta (or in this case, Barcelona) culture. Brunch is near and dear to my heart. Some of my favorite moments at Emory include late-night Waffle House runs my friends and I craved breakfast foods at 2 a.m., or waiting an hour for a table at The Flying Biscuit Cafe on a sunny Saturday morning. Atlanta is known for its thriving brunch scene, with an endless amount of new morning dishes to fall in love with. But this semester I stepped away from this Southern brunch mecca to study abroad in Barcelona, Spain. With little prior knowledge of European food culture, I soon learned that the most common breakfasts for Spaniards are quite different from what I was used to. They eat pastries like croissants, donuts, “montaditos” — small sandwiches filled with cheese and sometimes ham — or little “tostadas,” which locals typically smear with fresh tomato. Eggs are almost never eaten in the morning — their version of the omelet, a Spanish tortilla, is reserved for lunch or dinner because it’s considered too heavy for the early hours. I’ve come to keep track of a few of my brunch highlights from my first three months abroad. One of my first trips from Barcelona was to the smaller city of Valencia, a beach town a few hours south of Barcelona featuring beautiful views from the city’s cathedral and gentle Mediterranean waves crashing yards from the best paella in the world. Here, I went to an “American” brunch place called Brunch Corner, which serves a peanut butter and jelly sandwich listed as “America’s Favorite Sandwich.” Stepping off the streets of Valencia and into Brunch Corner felt like coming back to the states. From blueberry pancakes to a breakfast sandwich as big as my head, my mouth watered reading the menu. With eggs poached to perfection and a light yet creamy hollandaise, the eggs benedict certainly did not disappoint. Known for the running of the bulls in July and Ernest Hemingway’s novel, “The Sun Also Rises,” Pamplona is a small city in the northern Basque region of Spain. It is quaint, saturated with history and home to the best little pastries I have ever eaten. They’re called “garroticos,” and are only served at a shop called Beatriz. Despite the 45-minute wait, these decadent chocolate desserts were well worth it. 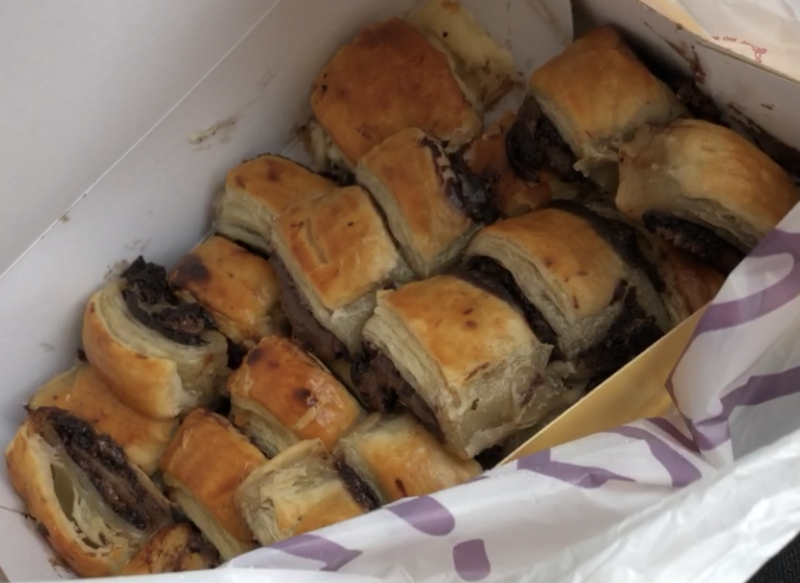 Although this bakery’s signature item is not exactly a meal and the shop is only a grab-and-go counter, I sat down with my box of warm garroticos and sipped on a cup of coffee as a mini-brunch that morning. I would have eaten garroticos for dinner, too, if Beatriz did not close at 2. The pastries had flaky croissant-like crust and a milky, rich chocolate center which blended together beautifully and melted in your mouth. I think I ate 10. Colorful buildings and intricate sidewalks make a stroll through Lisbon one of the best ways to spend a warm afternoon. This vibrant, diverse city brings together the historic and the modern, with ancient Roman archeology, a Christ figure imitating Rio’s and a central bridge modeled after San Francisco’s Golden Gate. The same is true for the cuisine. Here, I ate brunch at O Pão Nosso, a tiny corner shop that served enough food to feed me for three days. Freshly squeezed orange juice and a cup of coffee were served with a basket of colorful, flavored breads from a hot-pink strawberry to a yellow lemon bread. Their bread basket included pancakes and came with a meat and cheese platter including Iberian ham and smoked salmon. This starter was then followed by a lovely eggs benedict, a pastry tray and a cup of yogurt with fresh honey and walnuts on top. It’s hard to pick a favorite meal, but this one was definitely a strong contender due to the vast array of dishes we sampled and the freshness of all the ingredients. Brussels is considered the capital of Europe because it serves as the center of the European Union. Because of this Brussels had a very international feeling to it — a mix of languages, cultures and food blend seamlessly into this beautiful, historic city. Upon arriving to Belgium in late February, I couldn’t wait to sit down for a warm drink and a break from the subzero temperatures. At Peck 47, not only did I choose my chai latte from a variety of delicious hot beverages, but I ate eggs benedict on waffles flavored with leek and cheddar cheese. Although I loved tasting Belgium’s signature sweet “gaufres” — the French term for waffles — this savory spin on the classic was definitely my favorite. This spot only serves eggs benedict on waffles and a few varieties of smoothie bowls. It was a small restaurant with walls decorated in murals and quite a few tables close together with gave the interior a communal, family feel. French cheese. That’s pretty much how I would sum up my trip to Paris. But apart from the cheese, the city of Paris is just as beautiful as everyone says. From ornate terraces outside every window, to small quiet side streets which feel untouched by time to the stunning Eiffel Tower, I fell in love with Paris’ feel from the moment I arrived. 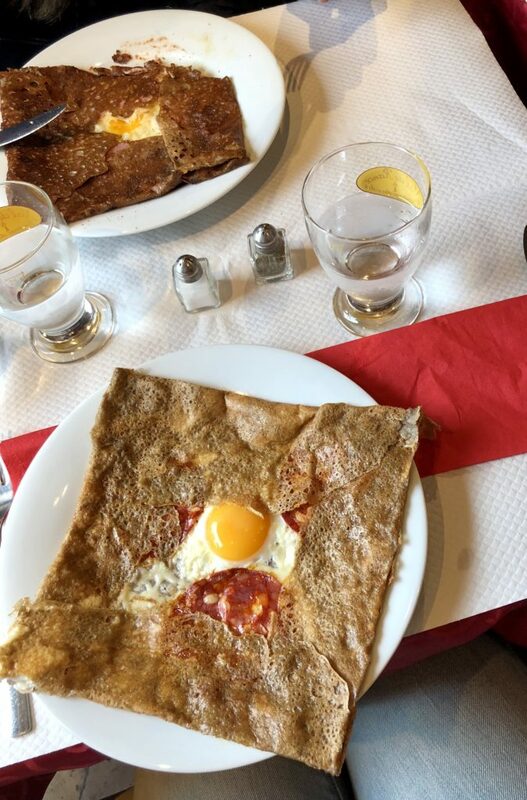 My brunch pick here was a small shop in Versailles called Le carre aux Crepes, where I ordered a chorizo, egg and cheese crepe with a runny yolk. I would like to say the egg was the star of this meal, but honestly, it was the emmental cheese that stole the show. This spot served crepes with any combination of fillings I could imagine, from savory dishes like bacon or ratatouille to dessert crepes like their signature apple caramel. On top of the delicious crepes, the place offered a fun atmosphere featuring a stack of board games at the counter you could borrow and play. There are so many American-style brunch places throughout Barcelona that I have not even come close to trying all of them. But some of the highlights from my Saturday selections include a fresh yogurt bowl with homemade granola at Itacate, a scrumptious, buttery Iberian ham egg scramble at El Arbol, locally baked bagels with a crunchy exterior and a fluffy interior at Barcelona Bagels and a warm, rich walnut brownie from Rosie’s own secret recipe at Rosie’s Good Things. Sometimes being immersed in a different culture for an entire semester can be tough, but there’s something about taking a bite into interesting twists on familiar brunch fare that makes a new city feel like home. Emory is fortunate enough to send many students abroad throughout the world every semester, but even if it doesn’t sound like the right thing for you, seek out different experiences and food within the United States. Even though I was once only a French toast kinda-girl, I’ve learned to appreciate a good gaufre, too.